"Welcome to your new obsession," says Becky Albertalli, author of Simon vs. the Homo Sapiens Agenda, about this raw, honest YA debut celebrating music, friendship, romance, and life on the road.Chelsea thought she knew what being a rock star was like . . . until she became one. After losing a TV talent show, she slid back into small-town anonymity. But one phone call changed everything Now she's the lead singer of the band Melbourne, performing in sold-out clubs every night and living on a bus with three gorgeous and talented guys. The bummer is that the band barely tolerates her. And when teen hearthrob Lucas Rivers take an interest in her, Chelsea is suddenly famous, bringing Melbourne to the next level--not that they're happy about that. Her feelings for Beckett, Melbourne's bassist, are making life even more complicated. Chelsea only has the summer tour to make the band--and their fans--love her. If she doesn't, she'll be back in Michigan for senior year, dying a slow death. The paparazzi, the haters, the grueling schedule . . . Chelsea believed she could handle it. But what if she can't? ***"Going on tour with Chelsea and the Melbourne guys made me feel like I was on the best summer break of my life. Once you start reading For the Record, you won't want to stop!" --Leila Sales, author of This Song Will Save Your Life"A fresh look at teenage stardom and the music industry that avoids gimmicks and clichéd plotlines in favor of realistic characters and a heartfelt love of the subject. I adored hanging out with Chelsea and the boys of Melbourne--when they felt the music, I felt it, and when they were off their game, so was I. Fun, fast, and colorful, this book isn't just for music lovers, it's for anyone who ever looked at a band onstage and thought, 'I wonder what that would be like.'" --Francesca Zappia, author of Made You Up"A pitch-perfect and utterly addictive debut. Pure escapist fun!" 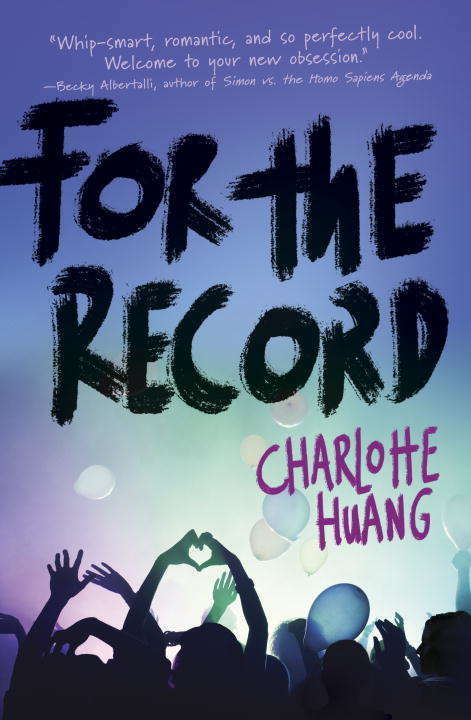 --Michelle Krys, author of Hexed "Charlotte Huang is an author to watch! This fast-paced and funny debut had me hooked from page one. Like your new favorite song, this is a story that stays with you!" --Morgan Matson, author of Since You've Been Gone"Whip-smart, romantic, and so perfectly cool. I can't get enough of this girl, this band, these friendships, and this showstopper of a book. Welcome to your new obsession." --Becky Albertalli, author of Simon vs. the Homo Sapiens AgendaFrom the Hardcover edition.